For combined state and federal posters, choose your state here. For businesses subject only to federal labor law, such as those located on military installations, in the American terrirtories (Puerto Rico, Guam, Marianas Islands), and on Native American reservations, the Space Saver-5 All-On-One Labor Law Poster fulfills all mandatory posting requirements. 7. Federal Family and Medical Leave Act (FMLA) Notice - for employers with 50 or more employees within a 75 mile radius. Our unique "All-On-One" feature saves wall space and ends bulletin board clutter for your labor law posters. There is no need to separately purchase posters that cover each individual Federal law. Order today! Available in Spanish and in reversible (two-sided, horizontal and vertical) versions. 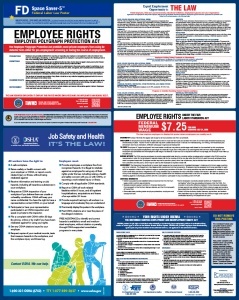 Get your updated federal labor law poster today and stay in compliance and fine-free.